The most obvious deformity with a flat foot occurs on the inner border of the foot in the region of the arch which sits close to the floor when a person stands. Even though not the most pronounced the following right foot (left picture) illustrates this aspect well. However the foot is a three dimensional structure and if the arch flattens then there will be related changes in it shape and orientation in other areas. The correct medical term is a plano-valgus foot. ‘Plano’ refers to the flattened arch,and valgus to the heel position which angles away from the midline of the body. Many adults feet are “flat” and entirely normal .There is a range of what normal looks like from fairly high arched to “flat-footed” with most people in between and in children a flat foot shape can be a normal stage of foot development. Most normal Flat feet are also known as “physiological” and allow entirely normal day to day and sporting capabilities. Key in diagnosing a physiological Flat foot is that it is normally bilateral, painless, longstanding , non-progressive and flexible. What flexible means in medical terms is that the flat foot can convert into a foot with a far more “normal” profile when a person stands on tip-toe. This is usually best determined by someone looking at you from behind to determine how your foot performs. If this happens then this it is possible to say that the joints, tendons and ligaments (which go to form the arch) are all functioning normally. The pictures below illustrate this defect well on the left side. The causes & symptoms of Flat feet . The symptoms that might result from a flat foot will be dependent to some extent upon the underlying cause . Probably the most common cause of a flat foot in the adult is inherent ligamentous laxity which results in bilateral , flexible deformities known as known as a physiological flat feet. It is simply a version of normal. The natural history of such a foot is probably not one of deterioration and management can therefore be purely based around whether it causes symptoms or not. If there are symptoms these may be locally from the foot due to its off-midline position resulting in pressure through the medial aspect of the foot and arch and the tip of the fibula . Both areas can cause local pain due to high pressure generated during weightbearing. Pain may also occur higher up the leg in the knee ,groin or low back secondary to the foot position causing slightly abnormal transmission of forces through the lower limb. If a physiological flat foot is symptomatic management is most often with an orthotic (or insole). These are usually unilateral ,painful and are sometimes (though not necessarily) a fixed deformity. There are many potential causes for the deformity can occur at different levels in the foot & ankle due to loss a of integrity of any number of key components of the arch structures. 1) Bones & joints : By disrupting the normal bony architecture of the arch arthritis and fractures can alter the way the joints sit and the arch may flatten. Calcaneal fractures and Lisfranc injuries are most likely to have this effect. In diabetics a particularly rapid collapse can occur if a complication called Charcot arthropathy develops. This is usually in those with severe sensory loss and can be limb threatening. 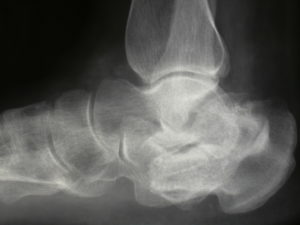 One particular condition that presents in late childhood/early adolescence with a frequently stiff and painful flat foot is a developmental one called Tarsal coalition (seen in the X-ray below with a clear bony bar across the middle of the X-ray). 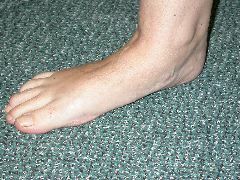 One or more joints in the mid/hindfoot spontaneously fuse together abnormally and result in a fixed flatfoot deformity. 2) Muscles , tendons & ligaments : The common cause is Tibialis Posterior Dysfunction .This tendon lies on the inner border of the foot and has a vital role in maintenance of the arch. It lengthens when diseased contributing to the loss of the arch and the development of a flat foot. An additional bone called an accessory navicular can also sit at the Tibialis posterior tendons insertion point into the foot and this may also be associated with a slightly flatter foot and local pain. Neuromuscular pathologies can also result in plano-valgus foot & ankle deformities and there are a large number of these (but this is an uncommon reason). Also uncommon is a tear or rupture of one of the supportive ligaments underneath the medial arch called the spring ligament. This can be a difficult structure to image in making the diagnosis. In the more sporty and active person a repair is usually required . In most flexible flat feet orthotics are usually the recommended first line of treatment. In a rigid flat foot orthotics cannot correct the foot position but they may be able to improve symptoms. Orthotic treatment should reposition a mobile flat foot and hold it in a corrected position. 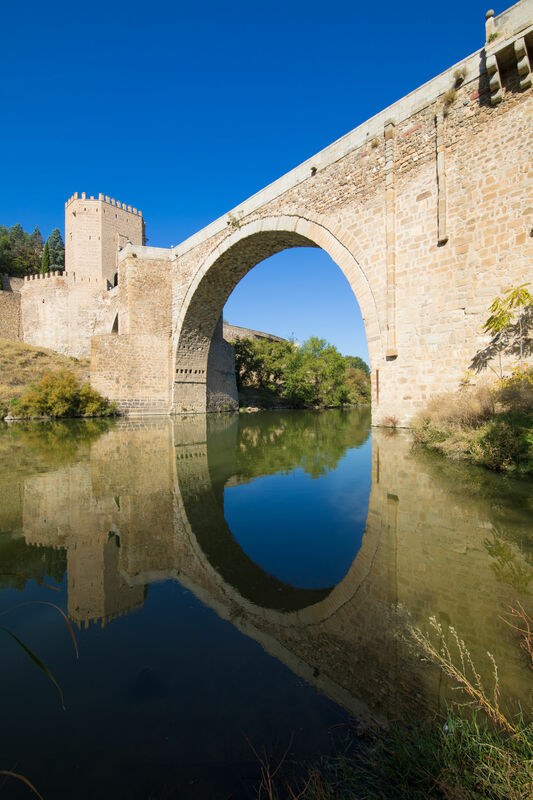 The inner border of the arch should be elevated from the ground and re-supported with an arch as seen here. The heel also needs to be repositioned by placing a “wedge” under its inner side to tilt it and a heel “cup” to hold it as demonstrated in these images. The improved position is only present when the orthotic is worn and ceases if it is not worn. Improvement in symptoms can sometimes continue. Whatever the cause of the flat foot the techniques used will be essentially the same. With Tibialis posterior dysfunction a progressive deterioration of the rest of the hindfoot and ankle is described if the deformity is left. Over what time period this occurs and whether it is inevitable is not definitively known. The stakes are however potentially high as the progression may be to a rigid, painful and arthritic deformity if left untreated. 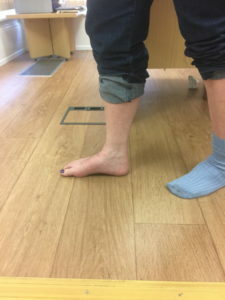 If an Orthotic controls both the deformity and the pain then this may be all that is required to manage the condition. A tendon reconstruction may be needed however if this is insufficient. Once painful, arthritic and stiff the unilateral flat foot may require a triple fusion for correction which can itself lead on to late onset arthritis of the ankle or other joints . With Tibialis posterior tendon dysfunction a progressive deterioration of the rest of the hindfoot and ankle is described. 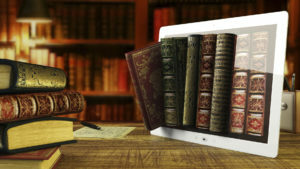 Over what time period this occurs and whether it is inevitable is not definitively known. 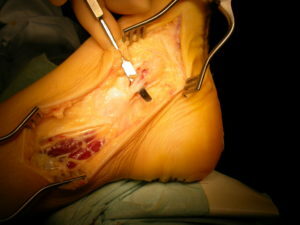 The initial presentation may simply be localised pain and swelling in the line of the tendon immediately behind the medial malleolus as shown in this image. If left untreated the Tibialis posterior tendon may stretch and as a result the arch profile becomes lost and the foot flattens. At this stage orthotic management may suffice but if it doesn’t control pain then a reconstruction of the tendon is usually advised. This may have various components to it . Most commonly the Tibialis posterior tendon is surgically debrided (seen right) and a healthy neighbouring tendon is detached from its insertion and routed to boost the weakened Tibialis posterior (left image). The stakes are however potentially high as the progression may be to a rigid, painful and arthritic deformity. If an Orthotic controls both the deformity and the pain however this may be all that is required to manage the condition. 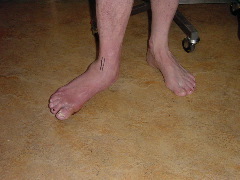 The fixed and arthritic flat foot may require at least a triple fusion(see below) and at worst a triple and ankle fusion (or replacement) combined (If the ankle has become involved). This is more extensive and “higher risk” type of surgery than treating early with a tendon reconstruction. After the anaesthetic has worn off your foot should be largely free of pain ,due to the use of nerve blocks(Femoral and Sciatic). You will be given a course of pain killers and anti- inflammatory tablets .These will be working for you when the nerve blocks wear off by 12 hours or so . You may also require a PCA analgesic pump. Immediately after the operation you will have a temporary plaster cast. The day following this will be changed into a lightweight fibreglass cast. Check X-ray at 6 week stage . Into long post-operative boot and gradual increase in weight-bearing at this stage .Add an “off the shelf” supportive , semi-rigid 3/4 length orthotic , for the next 3 months. Physio to work on ankle range and ankle and subtalar balance and strengthening regime from 9 weeks or so. May be comfortable enough to make transition into stiff soled walking boot by 12 weeks. Remain in this for all weight bearing for a further 6 weeks as a minimum. Orthotics may be required in some be required in the longer term . A full functional recovery will not unusually take 6 months. The chance of significant reduction in pain and improvement in function is of the order of 85%. 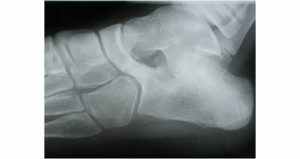 The chance of failure of the surgery to the extent that midfoot fusion is required is 10%. It may still be necessary to use a corrective orthotic after surgery . The fractures and arthritic deformity which most commonly can effect the alignment of the arches are Calcaneal , Lisfranc and Ankle. One objective of acute fracture management is to realign the effected joints. This is not always achievable or if it is a progressive ,subsequent deterioration may occur. Under such cirumstances corrective realignment fusion surgery may be necessary. 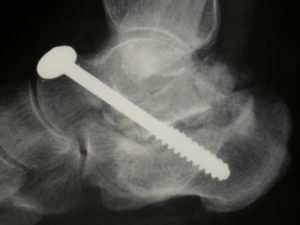 Shown below is the result of a bone block type fusion through the Lisfranc joints. Below is another example of reconstructing a flat foot following a malunited Calcaneal fracture using a bone block into the subtalar joint to regain arch profile. This type of realigning fusion surgery is very successful both in terms of deformity correction as well as loss of pain .Broadly speaking heavy and prolonged activity is possible following complete bony union. After the anaesthetic has worn off your foot should be largely free of pain ,due to the use of nerve blocks(Femoral and Sciatic) . You will be given a course of pain killers and anti inflammatory tablets .These will be working for you when the nerve blocks wear off by 12 hours or so . A physiotherapist will instruct you on the use of crutches the day following surgery. You will be non weight bearing on the operated foot for a period of six weeks. One or two post-operative days depending upon comfort and mobility. 4-6 weeks of prophylactic anticoagulation. You will require an outpatient assessment and wound review. Self absorbing sutures are normally used .Your lightweight cast will be changed and non weight bearing will continue for another four weeks. You will require an outpatient assessment and check X Ray to confirm satisfactory progression of the fusion. You are likely to be advised to increase your weight bearing through the cast as symptoms dictate and gradually cease using crutches. Your cast will be removed and a final X-ray taken . You may now return to normal shoe wear and activities a able. The position of your foot will be much improved. It is likely that your function will be improved and there will be a significant reduction in your pain. There is a small chance of one of the joints not fusing. By 5 to 10 years there is a high chance of developing arthritic change in the neighbouring ankle and remaining midfoot joints. The reason for this is ,as with ankle fusion ,the stresses through the remaining joints are increased. It is likely that the effect of this upon you will be minimal at this stage but may progress and become more problematic later. I have consulted Mark Herron on 2 occasions over the last 8 years. I have had problems with my feet and ankles for a number of years and it had been getting progressively worse where I could only walk yards without stopping and being in severe pain. My issues were that I have become flat footed in both feet, had arthritis in my left foot and the ankle tendon had become weak and loose. 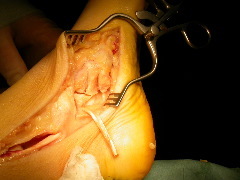 The first operation, the tendon was tightened and my heel re-positioned. This was fine, for a couple of years but then the arthritis and flat footedness became too painful and last May (2016) I again had another operation. This time Mark removed the arthritic bones and put in a metal arch to give me a more normal gait. Following the first operation I knew it wasn’t an easy recuperation and would require much dedication in keeping up with exercises and not doing too much too soon. However, after the first week or so I was pain free. I still have to continue with strengthening exercises to ensure I keep my gait correct. I am able to do most things I want, including spin and other exercise classes and, probably a bit stupidly, recently walked 35 miles in 4 days on a trip to Copenhagen. Although it took me some time to recuperate I was really pleased that I was able to do this. I will need a similar operation on my other foot within the next 12 months and wouldn’t consult anyone else. I just thought that I would update you on progress. It is now almost exactly 2 years since I had my traumatic car accident. At the time I have serious doubts about whether I would be able to live a normal life again. However the initial decision on the approach to remedial treatment was borne out of expertise and experience and proved to be fully indicated by subsequent events. The subsequent surgical reconstruction of the foot was awesome and was reflective of you, and the Clinics leading edge capability in such areas of traumatic injury. I am now running again and doing everything that I did pre the accident. For this I am eternally grateful that I was recommended to yourself and the Clinic immediately post the accident. I was referred to the Foot and Ankle Clinic in 2006. An operation on the same foot, by a different surgeon, had been unsuccessful, and so it was with trepidation I decided to try again. After my first consutation I knew that this time it would be very different. The format for my treatment was explained in a clear and precise manner. I met The Clinical Specialist Orthotist, who fitted me with custom foot orthoses. I had a very enlightening appointment with him, where casts of my feet were taken for custom made orthotics, which were amazingly ready for collection within the week. Although the orthotics gave me some relief it was soon clear that I would need to progress to surgery. The surgeon guided me through what the procedure would entail and a series of x-rays and scans followed. All the staff where polite and professional at all times. I was in hospital for a total of four days where I experienced the care and kindness expected from such a dedicated team of professionals. I had follow-up appointments at the Foot and Ankle Clinic for a further five months during which time I was confident that if I was worried about anything with regards my recovery I needed only to pick up the phone. The Foot and Ankle Clinic restored my faith in the medical profession. Ten years ago I retired from a wonderful career. At first I had plans to travel and visit places I longed to see. My husband and I got off to a good beginning, but soon my left foot became painful and deformed. I could walk for only short distances. I visited a podiatrist and used orthotics. These helped for a time, but my foot got progressively worse. The condition put limits on my active retirement. Sightseeing and even my shopping sprees were threatened! I visited my GP, who arranged for x-rays at my local hospital. This was quickly followed up by my GP with an appointment at the Foot and Ankle Clinic. At my first appointment the surgeon diagnosed the problems – more than one! This was followed by ultrasound and CTscans, which confirmed the diagnosis. The first operation was on the toes and the forefoot. Several weeks later I had a Lisfranc fusion in the midfoot. Both operations have been successful. My foot is better than it has been for years! I found everyone at the Clinic to be a pleasant, caring and efficient. My surgeon took time to listen and explain what was happening. His diagnosis, surgery and after care have been excellent. If I could turn the clock back I would have seen him years ago. I am delighted with the outcome. With a few bits of metal in my foot I am me again! Mr J Tonks ,Birmingham ,2017.